Joni is a guest on the debut show of Showtime Coast to Coast for a jam session with host Herbie Hancock, Bobby McFerrin, Wayne Shorter, David Sanborn and Larry Klein. 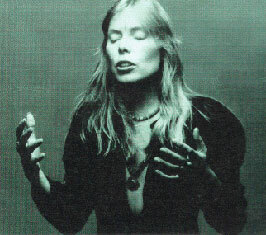 Joni leads a discussion on Furry Sings The Blues then the jam begins followed by Hejira. Cable TV's Showtime Coast To Coast was a unique series of in-concert performances, interviews and collaborations hosted by Herbie Hancock. Several of us were wondering who the percussionist was in the band, as he's not listed. It's Steve Thornton.